With winter upon us and the fresh air of spring still a few months away we wanted to take time to remind you that you don’t need to avoid being active in the winter. Even though March can be one of the worst months to get stuck indoors, don't forget you can have a great deal of fun when the air is crisp and cold. And as a dog parent, you really don’t have the luxury of staying indoors all day, every day, right? Your dog needs to go out. At Unleashed, we understand how cold snaps in the weather here in Calgary make you want to just curl up with a blanket, hot drink in hand and a furry friend beside you. We are here to encourage you to get out and have some fun, so both you and your dog will come through the winter feeling happier and healthier. Get Out and Go, Together! Instead of dreading the cold air on your face, make the most of it and GET OUT AND GO! Together with your dog, you can add new walking routes to your regular routine, change up the time of day you walk, and incorporate different walking patterns into your activities. As long as you are moving at a brisk pace, you should warm up in no time. 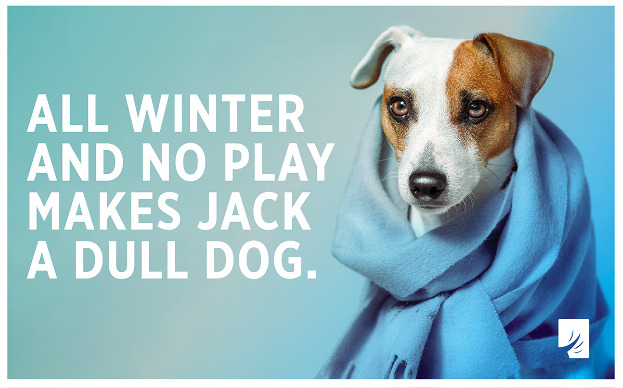 Sure, it’s cold initially, but if your dog can do it, you can too! Getting out and enjoying the cold weather means you and your pet get more out of life together! And if the Polar Vortex is just keeping everyone inside, there are many fun activities for the whole family. Play hide and seek, plan a scavenger hunt searching for delicious treats, have fun with a puzzle toy, teach your dog a new trick, or practice some patience training. You can also keep your dog busy, stimulated, exercised and happy by sending them to daycare! 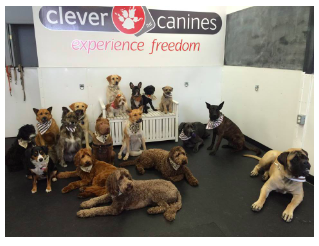 Our favourite place is Clever Canines who offer “day school”, providing a structured day of learning, playing, walking, and relaxation. All of these examples are excellent ways to address the pent up energy that occurs during those cold spells. One of the most common reasons pet owners say they reduce their outdoor time in the winter is because they worry about slipping and falling, or they worry that the weather is too harsh for their animals. These are valid considerations for sure! The truth is that getting outside is just as important for you as it is for your dog, so you can avoid the excuses by being prepared with the proper equipment and a plan. Unleashed is proud to offer customers a variety of outdoor gear designed to help your pets stay warm and safe in colder weather. REMEMBER we dress for the weather...our dogs have the same outfit year round. I often see the bundled up human braving a minus 25-degree day, and yet their dog has the same outfit on as on a cool summer morning! 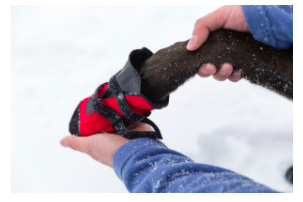 The right gear such as sweaters, jackets and paw protection are something your pet needs when you are braving the frigid conditions together. We must be conscious of the more delicate dangly bits too. This includes ears, tails, and couple other items on the boys! Products designed with function in mind are required. Fashion is secondary, but can definitely still be achieved! When it comes to staying safe outdoors, there are a few rules to follow when walking your dog. For starters, avoid walking in slippery areas: if the sidewalks have not been cleaned, take the time to go around or find another route. Ensure you have reflective gear when walking at night so you and your dog are more visible. Lights on collars or collars that are lights work really well! Even on milder days our pathways and sidewalks are usually a minefield of salt which can burn your dog's feet. So before venturing out protect your pup's pads. Boots are best, however, there are also some great paw balms and rubber boots that can help protect their pads. Remember that if you are slipping and sliding, your dog can also be at risk of injury. Especially if playing exuberantly in the park! Better to curtail too much play and avoid a pulled muscle or the all too common damaged pads and torn toenails. Dogs just want to have fun, and do lack the common sense to be careful. Especially in the moment of pure snow filled bliss! An often overlooked safety issue is the temperature inside our parked cars in winter. Our extreme low temperatures are equally dangerous to hot summers days! 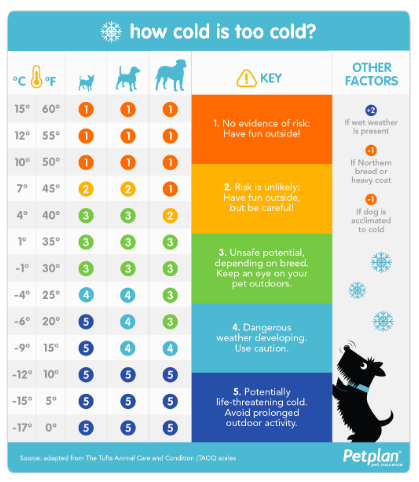 We suggest leaving your dog home safe and warm when the trip isn’t to a mutual destination, like when you're coming to unleashed or another pet-friendly venue where your buddy is welcomed inside! 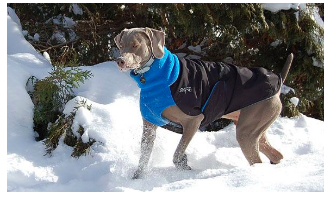 For more information about the outdoor gear we offer to help keep your pet warm and dry while enjoying winter activities, call us or visit our wholistic pet shop online. Our friendly and knowledgeable staff welcome your questions so that you can make an informed decision to ensure you get the right product for the right activity. If you live in Calgary, we’d love to have you drop by our location at 2715 14 St SW, Calgary, AB or you can give us a call at 403.245.0861. We can help you make choices that lead to a more wholistic lifestyle for your pet.